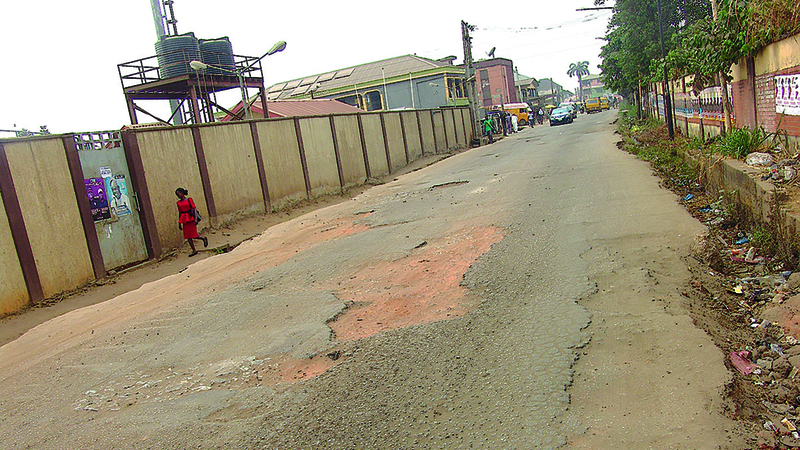 Commuters plying the Pen Cinema en-route Stadium road to Ogba are beginning the New Year carrying over the burden they have endured in recent years. While road users in other parts of Lagos are heaving a sigh of relief over the rehabilitation of some critical roads in their areas, it is a rough deal for the Pen Cinema/Stadium road users. The road passing through the front of the Agege Local Government Area secretariat behind the magnificent Agege Stadium was once very smooth and the pride of the imposing secretariat, but it is today an eyesore of its former self. From Pen Cinema, after the market, through the council secretariat behind the stadium and towards Ogba is a litany of potholes. The immediate hardship to road users is that the journey that shouldn’t last five minutes takes nearly 30 minutes if the slow moving traffic is not held to a standstill. Mr. Adenekan Edun, a civil servant who resides in the area lamented the situation of the road, which he described as an eyesore. Reacting, the Commissioner for Works and Infrastructure, Mr. Ade Akinsanya, said the Lagos State Public Works Corporation (LSPWC) has intensified efforts to fix all potholes across the state and would soon get to the areas not yet touched.